Booyah Base is a mall in Inkopolis Plaza. 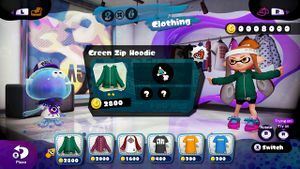 It is comprised of a variety of shops in which players can purchase the several types of gear available in the game. Ammo Knights is a weapon shop run by Sheldon. It can be accessed from Booyah Base. Players can purchase weapons here with in-game Cash earned in multiplayer matches and amiibo challenges. However, players have to be at least Level 2 to be allowed to buy weapons here. Ammo Knights sells weapons of all weapon classes: blasters, chargers, rollers, shooters, sloshers and splatlings. It also features a Shooting Range to experiment with potential purchases. For a list of purchasable items, see Main Weapons. Cooler Heads is a headgear shop run by Annie and Moe. It can be accessed from Booyah Base. 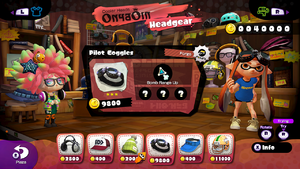 Players can purchase headgear here with in-game Cash earned from multiplayer matches and amiibo challenges. However, players have to be at least Level 4 to be allowed to buy headgear here. Like all gear stores, the merchandise changes every day. For a list of purchasable items, see Cooler Heads. Jelly Fresh is a clothing store run by Jelonzo. It can be accessed from Booyah Base. Players can purchase clothing here with in-game Cash earned in multiplayer matches and amiibo challenges. However, players have to be at least Level 4 to be allowed to buy clothing here. Like all gear stores, the merchandise changes every day. For a list of purchasable items, see Jelly Fresh. Shrimp Kicks is a shoe store run by Crusty Sean. It can be accessed from Booyah Base. 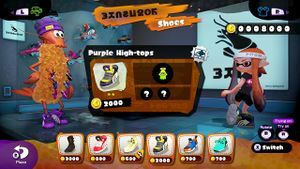 Players can purchase shoes here with in-game Cash earned in multiplayer matches and amiibo challenges. However, players have to be at least Level 4 to be allowed to buy shoes here. Like all gear stores, the merchandise changes every day. For a list of purchasable items, see Shrimp Kicks. In each shop one of the four variations of DJ Lee Fish's song Lookin' Fresh can be heard. "Booyah Base" is a play on the word "bouillabaisse," a type of fish stew. 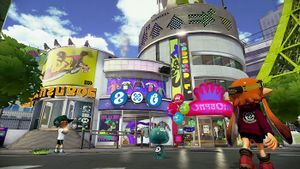 It is also a play on "Shibuya", a ward of Tokyo, Japan, parts of which inspired Booyah Base and Inkopolis Plaza as a whole. "Ammo Knights" is a play on the word "ammonite," which is an extinct type of marine mollusk. "Jelly Fresh" is a play on the word jellyfish. The word "Ebisu" in Shrimp Kicks' Japanese name comes from that of the Japanese god of fishermen and luck, Ebisu. The three gear-selling shopkeepers all wear more than one of their gear type. Annie has three pieces of headgear: glasses, headphones, and a hair accessory. Crusty Sean wears four pairs of shoes at once on his eight legs. Jelonzo has four different potential shirts, rotating them daily. Annie's has louder treble, i.e. vocals, and minimal percussion, giving it a weaker sound in that respect. This is a reflection of her shy, detached personality, as well as the fact that she sells gear for the top part of the buyer's body, hence the emphasis on the treble. Jelonzo's music is faded out except for the melody, the "center", because his gear goes on the middle part of the body. It also has many bubbly sound effects in the background, showing his bubbly and ecstatic personality as well as referencing his gelatinous species. Crusty Sean's has the bass turned all the way up and emphasizes percussion, because his gear corresponds to the lower part of the body. Furthermore, the heavy beat gives it a bouncy sound, reflecting his outgoing personality. Sheldon's music is more distant, showing his separation from the others as a weapons dealer. It also has static and other sounds reminiscent of a military radio, as a reference to his obsession with the military. According to a developers' interview, Booyah Base was built on the land upon which Sheldon's home (and weapons shop) stood. However, it was not Sheldon but his grandfather, Ammoses Shellendorf, who owned the land. According to Sunken Scroll 18, there is an "Ultra-Mega-Hyper Sale" at Booyah Base, but when it is on is not mentioned. An overhead view of the statues at Booyah Base. An overhead view of the plaza in Booyah Base. A basic view of the Plaza. The exterior of Ammo Knights. The exterior of Jelly Fresh. The exterior of Shrimp Kicks. Sunken Scroll 18, an advertisement for Booyah Base. This page was last edited on 11 April 2019, at 20:39. This page has been accessed 40,165 times.